Once again it’s awards season and with that comes the 59th Grammy Awards 2017, and at a first glance you get an overall sense of having seen all of this before, minus Kanye West, who is seemingly nowhere to be found. Moreover, what strikes us even faster is the down right terrible state of music these days, as if we needed a reminder as big as this one, to prove our point. Nonetheless, the nominations are in and some people are expecting other people to actually tune into this; let’s break it down and show you why you’re better off jumping into a time machine to physically stop this travesty of modern-day music, from becoming as bad as it really has become. Yes, like Marty Mcfly, only you have the power to re-write the future of music; with that, we bet that you would take the risk along with everybody else, so that we could avoid these kinds of songs for the sake of our future generations. However, now it’s too late, so let’s take a look at some of the names and nominations of the 59th Grammy Awards. Let’s go and see why the 2017 show, will be the least watched Grammy Awards show in history. The best reason to tune into this, will be to see the comedy of James Corden who is hosting the Awards ceremony at the Staples Center in Los Angeles this Sunday. For Album of The Year, there’s Adele with ‘25’, Beyonce’s ‘Lemonade’, Drake ‘Views’ & Justin Bieber ‘Purpose’. Yes, you read it all correctly; it’s just more of the same lineup of the usual establishment suspects. We think the Grammy gong will go to the “Cockney” voiced singer from Tottenham, London, yet again. Yes, who else but, Adele? She can sing that’s for sure. You sure as hell can’t give it to Drake or Justin Bieber, two truly shamefully bad artists, with music so bad, that even if you heard it in a shower, you would scramble out to try to shut if off. Or would you want Beyoncé to win because of Formation and or for George Soro’s investment into the ‘Black Lives Matter’ organization of violence and divide? Is this really the best music, the world has to offer? Sadly, this is what they believe to be true. However, Drake and Bieber have been said to be boycotting this seasons awards, so, no Grammys for them. Drake is conveniently performing a show in Manchester, England, whilst the Biebs is still all cut up about Selena Gomez. Where’s The Weeknd, in all of this? So, it’s Adele vs. Beyoncé! In ‘Best New Artist’, there’s a few nominees worth mentioning, ‘Chance The Rapper’ as if there’d be a fat chance that we would ever listen to that, then there’s Anderson.Paak, Dr. Dre’s new prodigy and we aren’t quite ready for that Hip-Hop to Hip-Pop tight pants wearing crossover, just yet either, but hopefully he wins ‘New Artist’. He’s the most exciting and genuine new artist in the Grammys this year. Unless, ‘The Chainsmoker’s‘ have something to say about it, but all we have to say is that this music industry, if this is the best, then please put it to rest. Or at least make some future changes and make music of some substance. Too much auto tune and just plain old garbage music, all around, to be honest. Soon enough, a Grammy Award will become as precious as a Razzie Award. Let’s find out more! For ‘Record of The Year’, we have Beyoncé (Sasha Fierce) with her Black Lives Matter inspired – Super Bowl 2016 performance, the song ‘Formation’, which was nice until the BLM group has really proven to be a sort of violent organisation funded by native-Hungarian, Billionaire George Soro’s plans to divide the races, with that whole anthem of a song, ‘Formation’. So, will it win? Well, with Grammys rewarding all and only establishment music, we think it might win something because of the globalist agenda. How ironic for Beyoncé to win this or lose this when not having Kanye West around to be there and heap praise on her, and then to rush the stage and do the opposite of what he does here below, to Taylor Swift. To do what? To speak his mind yet again, after recently being seen with Platinum blonde hair, before and after endorsing Donald Trump. Surely, that’s been the highlight of many Grammy Awards ceremonies in memory now, Kanye West stealing the limelights. There’s no real Grammys without Kanye, snatching the microphone from somebody and just letting loose. In fact, after he endorsed Donald Trump, he seemed finally to be making sense, but recently has been made to delete all his supportive Trump tweets. “Aha”, he wasn’t allowed freedom of his first amendment rights to free speech. Sing it with us! “Hello, is it the Grammys? Please show us something new”. And, the list of categories just goes on and on, dire to say the least and you start to wonder, if it’s only being watched by the friends and families of those that are nominated? Or are people tuning in for seeing everything else apart from the music, which is nowadays worse than ever. And, guess what else, Drake’s ‘Hotline Bling’ is nominated for ‘Best Rap song’, ROFLMA! What a joke! We hope you enjoyed that song there, one thing that is safe to say is that Beyoncé will be happy that Taylor Swift hasn’t got any album up for this years Awards, otherwise, she’d take home everything, as usually she cleans up all the Grammys. But, some of her work is good, not unlike Adele’s. 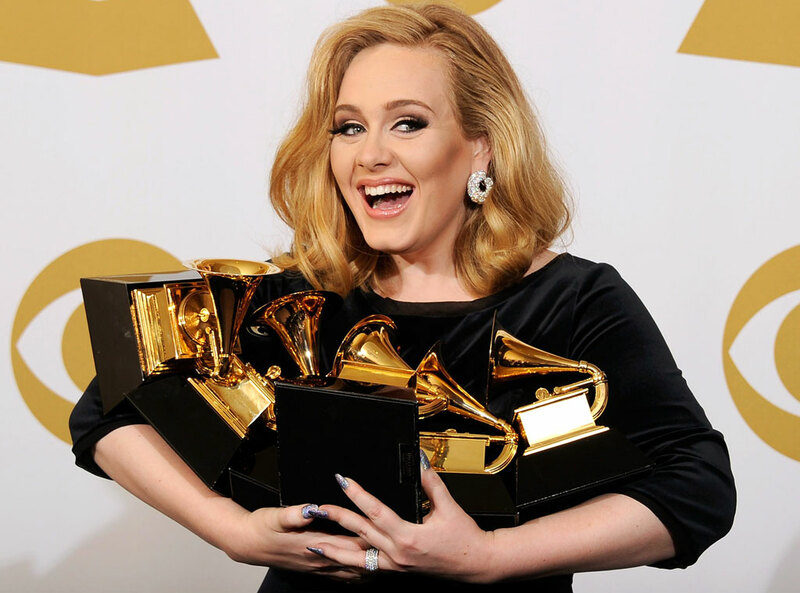 But, it seems like this year it might be Adele, who might also do that again this year, as she usually does, which is to clean up at the Awards. But, we are expecting Beyonce to win something, but she’s reportedly heavily pregnant, so will she even show? Also, sadly we can be sure that many artists that will get down on their knees to blow Satan’s seed and do some good old Trump bashing, yes, seize the opportunity to praise their hell raising masters with some more “Pro-Globalist”, “One World” jargon, using race and “LET IN ALL REFUGEES”, plus further gender labels, pro-feminism and other pre-written speeches to win brownie points with Lucifer and their backers. Oh Joy! We think the awards ceremonies should actually reflect good music and not be a political podium of artists views, that people would actually even listen to. “Oh well”, that must have only been viable up until the middle 1990’s, when it was all just about the music, a time when there was still real music left to enjoy and people bought physical CDs and there was no need for Youtube views, that seemingly counted as much, as they seemingly do today. So, will you tune in? Zzzzzzzzzzzzzzz. Previous Article← Migrants vs Zombies: They are taking over the world!